дома » ARMENIAN - ENGLISH CONVERSATION GUIDE հայերեն անգլերեն զրուցարան » ՀԱՅԵՐԵՆ — ԱՆԳԼԵՐԵՆ ԶՐՈՒՑԱՐԱՆ: ԵՐՐՈՐԴ ՄԱՍ: ՓԱԹԵԹԱՎՈՐՈՒՄ: PACKING. ՀԱՅԵՐԵՆ — ԱՆԳԼԵՐԵՆ ԶՐՈՒՑԱՐԱՆ: ԵՐՐՈՐԴ ՄԱՍ: ՓԱԹԵԹԱՎՈՐՈՒՄ: PACKING. 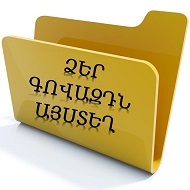 Ներբեռնել լավ որակով ( PDF) ՓԱԹԵԹԱՎՈՐՈՒՄ: PACKING. փաքին: (էջ 163-166). are very important for sales. Previous post: ՀԱՅԵՐԵՆ — ԱՆԳԼԵՐԵՆ ԶՐՈՒՑԱՐԱՆ: ԵՐՐՈՐԴ ՄԱՍ: ՏԵՍՉԱԿԱՆ ՍՏՈՒԳՈՒՄ ԵՎ ՓՈՐՁԱՐԿՈՒՄ: INSPECTIONT and TEST.